Sessionless paging - no timeouts for the query. Multiple tabs/windows allowed for paging. View-All option on the page number links (and in products per page dropdown). Ordering (sorting) drop-down for customers. Shows "hit" categories from the search as well as the individual products. Displays number of hit products. Shows the customer what they searched on. Ability to have static files to mimic specific searches. Allows you to do keyword searches and have filters on sub-products, and for multiple languages (translateproducts). The filter box (see "Refine Your Search" on the left panel of the demo) is configurable, and shows context-sensitive options. eg the list of colors shown will only show colors that relate to the products you've queried. For filters with configured context-sensitive lists-of-values (eg colors, mfg's etc), you can configure whether you want them as "switch" filters (where you can switch between different options, like the mfg filter in our demo), or as "multiple" filters (where you can choose more than one option and use "or" logic, eg show products that are either red or blue, like the color filter on our demo). The results page is a full url that includes all the user's search criteria, so your customers can page/refresh at any time - their search submission doesn't time-out like it does with standard VPCart. Because of the full url nature of the results/pages, your customers can do different searches in different tabs, and page on each tab/window without the queries conflicting like it does on standard VPCart. Whether a customer uses open-on-new-tab/window, or just clicks, it'll always show what they linked from and not conflict or timeout. Allows customers to choose products-per-page via a drop-down (the options available in the drop-down are configurable by the merchant). Allows customers to click on a view-all link which automatically shows their search results in a single page. The products-per-page dropdown also has this option in it. The "view all" option can be switched off for your site via your BYZ116 config options. If using "view all" then you also specify in your BYZ116 config options the maximum number of products to show on the "all" page (so that users can't view a single page of 10,000 products and cause memory problems on your server etc). Once on a "view all" page, the customer can click on a "view pages" link to revert to normal paging again. 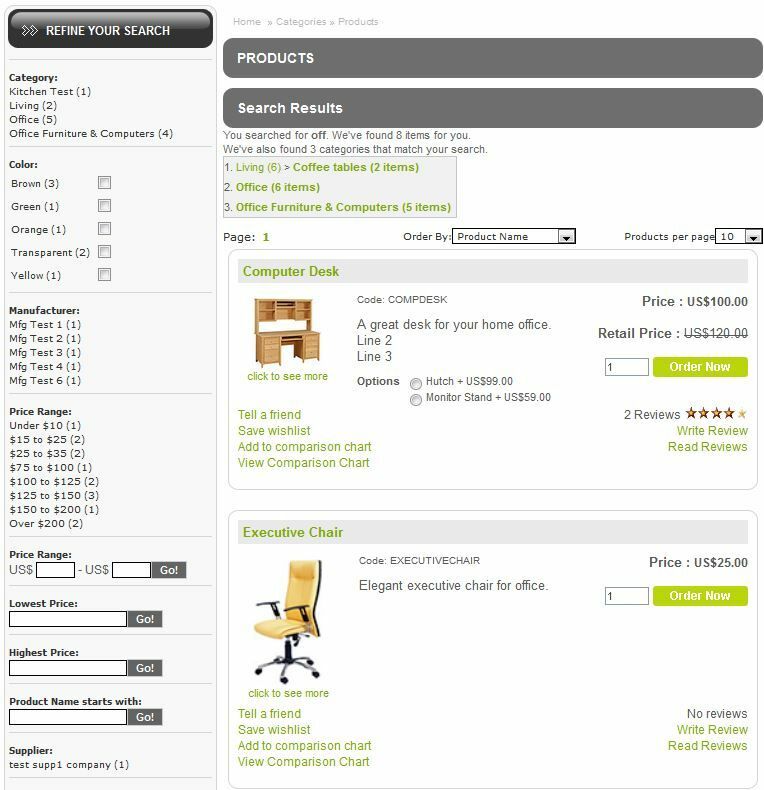 Allows customers to choose the order (sorting) they want the products to appear in via a drop-down (the options available in the drop-down are configurable by the merchant). 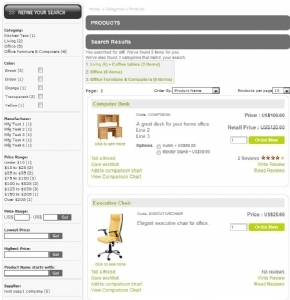 Shows a list of categories which matched the search, as well as displaying the retrieved products. The matched categories are then displayed at the top as a series of clickable search links with each element of the category tree being clickable/searchable. Shows the customer how many products were returned. Reminds the customer what they searched on by displaying their search string. Intuitive/simple google-style paging links (auto-scrolling across page-numbers as the customer moves page) - No need for next/previous "set" of pages links which just cause confusion; simple/intelligently-calculated paging links. A quick-search mini-form is automatically created using your config options, and you can optionally place that search mini-form on your side panel with a simple one line function call. The BYZ116 module has been structured in such a way that you can create any static file you want to mimic any shopdisplayproducts.asp url/arguments you want. See also the BYZ164 module which generates static "shopdisplayproducts.asp?id=x&cat=y" files for you with redirection applied. You can also configure it to use "intelligent" mode on keyword searches to improve the search logic from the standard VPCart keyword search. 02 16-FEB-2008 Added additional search types configuration/logic so that you can specify additional searches/queries that the paging/querying software can perform. Added filtering (extra restrictions) configuration/logic so that your customers can add more restrictions to an existing search (make sure your xproductfiltering config option is set to No as standard vpasp filtering should not be used in conjunction with this software. See also Step 13: Add header, trailer, filtering, and paging links to product summary displays, as filtering has been added to that step in 2 places). Corrected a bug where in some instances search tracking was causing a vbscript error. Changed search tracking to exclude searches on the getlang(langsearchboxdefault) value and to do a global (non-keyword) search if that value is used for the keyword. Added BYZ025 (Dynamic PopLists) module. 03 23-AUG-2008 Upgraded BYZ038 (from V08 to V09). Added decimal (double) options for additional search and filterings. Added a new facility so that you can display a search mini-form on your side panel; it uses the filter config options (in byz_sls_$config_filters.asp) to decide which parameter fields to show in the mini-form, see the note in the installation instructions regarding the BYZ_SLS_DISPLAY_FILTERING_SEARCH_MINI_FORM function call. 04 28-AUG-2008 Added logic to store the latest/current url that was being used for display-products in a session and variable so that stayonpage returns to the full product summary page when adding to cart from the summary pages. 05 18-JAN-2009 Upgraded BYZ038 (from V09 to V10). Upgraded BYZ025 (from V03 to V04). Upgraded BYZ121 (from V01 to V02). Minor changes in installation notes to avoid warnings on html validators. Added new display and installation step for shopsearch.asp screen. 06 27-MAR-2009 Upgraded BYZ121 (from V02 to V03). 07 30-MAR-2009 Upgraded BYZ025 (from V04 to V05). Upgraded BYZ121 (from V03 to V04). Changed query logic for categoryid/catdescriptions so that when they mis-match with id/cat arguments it still retrieves the data and displays the search critera text. For example on out of date links where the id argument is correct but where the cat (description) argument no longer matches the category description in the database. Tidied up some html so that it passes html validation without warnings. 08 02-JUL-2009 Added boolean type (tickbox) to filters as an extra option. Corrected page-number-line; was previously missing the % bit in the td widths. Changed productmatch logic to be in line with the latest version of vpasp. 09 24-NOV-2009 Split the query statement logic for product searches and related categories into separate files. Added a new option to allow direct-matching or product-matching for related categories. Added a new option to allow non-category joins for product searching. A new config option has been added to the main config file (byz_sls_$config.asp) to hold the Related Categories Type (xbyz_sls_related_categories_type). A new config option has been added to the main config file (byz_sls_$config.asp) to hold the Use Category Joins? (xbyz_sls_product_search_use_category_joins). 10 10-MAR-2010 Changed to be compatible with VPASP V7. Simplified installation process by providing shopsearch.asp and shopquery.asp files to do all the relevant redirections and to have an advanced-search form which uses BYZ116 arguments and added more default filters and more default additional-searches. Changed stylesheet to enforce spacing between page number links etc. Upgraded BYZ121 (from V04 to V05). Upgraded BYZ025 (from V05 to V06). NOTE: If upgrading from a previous version, please read installation notes as the includes are now in a different place and you need 2 of them instead of just one. 11 06-MAY-2010 Added extra options to allow for intelligent keyword searches (if you are using predictive searches on your site and you enable intelligent searches on BYZ116, then you need to also have BYZ161 V07 or above and set it to enable intelligent keyword searches on predictive searches). The default keyword search for BYZ116 is standard (non-intelligent) vpasp keyword searches. 12 13-JUN-2010 Added extra logic to the link/url logic so that default values arent included as arguments where they dont need to be (eg page=1 is not used in the links, the sort order argument isnt included in the paging links if youre just viewing using default sort-order etc). This helps keep the urls clean/small while still allowing full urls of all the relevant arguments. Added extra global variables to store the sql statement instead of using session value (this will allow search engines that make multiple concurrent calls to your site for different urls do the correct query). Added extra logic to cater for static shopdisplayproducts.asp pages where you can specify arguments inside the static files to replace any url/form-field argument/value (see BYZ164 module). Added new config options to the bottom of the config file to cater for static files (see BYZ164 module and BYZ116 technical notes). Changed ordering configurations to not use p. table aliases as this was causing errors on some versions of vpasp when vpasp executed paged queries. PLEASE NOTE: If upgrading from an older version of this module, the shopdisplayproducts.asp installation step is now different - the sql=GetSess(sqlquery) line below the BYZ_SLS_CREATE_SQL call now uses a variable instead of a session value and theres also a new include in that step for the byz_sls_shopdisplayproducts_seoredirect_inc.asp file. Also, the shopdisplayproducts.asp file is now split up into separate files. Also, the Request function calls within ProcessFirst inside shopdisplayproducts.asp need to be changed to use BYZ_SLS_REQUEST instead. Also theres a new canonical tag function call added to the header file change step; see installation notes for more info. 13 09-JUL-2010 Added extra logic to cater for generic vpasp static pages (for VPASP V7 or above). Note that we dont advise using generic vpasp static pages when using BYZ116 as the generic static vpasp pages are session-dependent despite having static filenames, and it will negate the full url aspect of BYZ116 which allows search engines to hit multiple pages at the same time with no problems; the advised solution is to use BYZ163, BYZ164, and BYZ110 instead to generate proper static pages. 14 17-JUL-2010 Changed shopquery/shopsearch logic to cater for more arguments so that more pre-byz116 links are catered for, and changed them to use 301 redirection instead of response.redirect. Changed keyword-splitting logic to treat commas in the search string like spaces. 15 14-OCT-2010 Added extra configuration options (xbyz_sls_config_viewall_flag, xbyz_sls_config_viewall_text, xbyz_sls_config_viewall_maxrecords, xbyz_sls_config_viewall_viewpagestext) and logic to be able to use a view-all link/url for paging links (ie to see all queried products in a single page, and a corresponding view-pages link to revert to normal paging again). Also changed to avoid vbscript errors when using pagesizes of at/below zero. Major overhaul/enhancements on how filters work/look. Added fully dynamic filters as an extra option (filters whose available values for choosing are driven from the results of the products query issued by the search), ie context-sensitive filter options. Added new function (BYZ_SLS_ADD_PANEL_FILTERING_FORM) so that you can display a filter-form on the header/trailer (eg in your left panel) when appropriate - this new side-panel filter form/block is in a different format to the standard filter block that is shown at the bottom of the shopdisplayproducts.asp pages, and is very intuitive for customers. See technical notes for more information on dynamic filters and the panel filter box that have been added on/since this version. 17 27-MAR-2011 Upgraded BYZ038 (from V12 to V13). Upgraded BYZ033 (from V09 to V10). Upgraded BYZ121 (from V05 to V06). Changed the sample filters to use the relevant restricted products/categories. NOTE: To upgrade to V17 or later of BYZ116, you must ensure youre using BYZ038 V13 or above first, and you then must make sure youre using BYZ121 V06 or above. 18 14-APR-2011 Upgraded BYZ033 (from V10 to V11). Upgraded BYZ121 (from V06 to V07). 19 20-APR-2011 Upgraded BYZ121 (from V07 to V08). 20 05-JAN-2012 Upgraded BYZ038 (from V13 to V15). Upgraded BYZ121 (from V08 to V09). Security fix/change for category filters setup. 21 24-JAN-2012 Added extra functions (BYZ_SLS_GET_MAIN_SEARCH_ARG_VALUE and BYZ_SLS_GET_FILTER_SEARCH_ARG_VALUE) so that you can find out (eg on a shopdisplayproducts.asp page or within your headers/trailers etc) what the value used was for a given filter code or main search argument code. This is so that you can display things like context-sensitive product-showcases on side panels etc. Also changed the file-existence check for files to use a more efficient method. NOTE: To upgrade to V21 or later of BYZ116, you must ensure youre using BYZ038 V15 or above first. 22 09-APR-2013 Added extra logic to do more to help stop injection/script attacks. Changed default word-split config option from N to Y. Enhanced the fall-through logic for working out products-per-page to use (ie so that it remembers the settings better etc). Added new functions/files so that BYZ175 (Product Attributes) data can be used for static and dynamic filters. Added extra config options for maximum sort, filter, page number, and search options so that array variables can be sized appropriately. Upgraded BYZ038 (from V15 to V23). Upgraded BYZ036 (from V10 to V16). Upgraded BYZ033 (from V13 to V18). Upgraded BYZ162 (from V05 to V09). Upgraded BYZ121 (from V09 to V10). Separated vpasp-version specific differences into separate files where possible to allow for easier maintannce. NOTE: If youve installed BYZ164 (Static Category Pages), then make sure you keep/paste-back your original byz_cfm_redirection_shopdisplayproducts_inc.asp include line at the bottom of the new version of the byz_sls_shopdisplayproducts_seoredirect_inc.asp file. NOTE: If youve changed your shopquery.asp or shopsearch.asp from their default status prior to upgrading to this new version of BYZ116, then make sure the relevant customisations are checked/re-applied to the new versions of shopquery.asp or shopsearch.asp as appropriate. (for a full list of effected files, see the version history readme file that comes with the zip file for this version). 23 23-JUN-2013 Upgraded BYZ038 (from V23 to V25). Added price range table and search/filter options for price ranges. Various enhancements made to improve efficiency/speed of cursors/logic and to help reduce memory usage. Added extra functions to make it easier to create your own filters (see the updated readme technical notes for more information). Added extra config options to help with the filter side-panel display (to hide/show the sorting options on the refine-your-search filter side panel, to hide/show the remove-chosen-options block on the refine-your-search filter side panel). Added compatibility for multiple languages so that keyword searches can use the translateproducts table. Added compatibility for sub-products so that keyword searches and filters can use search underlying sub-products as well as the main (parent) products. Added a new variable which can optionally be set inside manually-created static files to indicate that the visitor is browsing a manual static product-summary file; this new flag does NOT indicate that a given file was created via the BYZ164 (Static Category Files) file-generator, this is only used for manually created static files that you might create yourself, see the updated readme technical notes for more information. Added an extra note in the filter/search configuration files to explain that for top-level category filters/searches youll need BYZ055 in place unless all your categories are top-level (ie unless you dont have any sub-level1 categories). NOTE: You must be using BYZ038 V25 or above before upgrading to BYZ116 V23 or above. NOTE: If upgrading from a previous version of BYZ116, you need to upload the byz116_prepare.asp file to your admin folder and press the GO! button before you install/upload the new/changed BYZ116 files (and you must be logged into admin before you browse/run it), then delete the byz116_prepare.asp file from your admin folder. This will create the price ranges table and some sample data for it. NOTE: If upgrading from a previous version of BYZ116, then after running then deleting the byz116_prepare.asp file you need to add the price ranges admin menu option to your admin navigation and also grant-out access to that menu link AND to the prr_priceranges table to relevant admin users (see the updated installation notes for more information). 24 24-JUN-2013 Upgraded BYZ038 (from V25 to V26). Changed to use the new BYZ038 functions to work out the where clauses and logic for keyword searches (so that the logic is also shared with BYZ161, and centrally/easily updated). NOTE: You must be using BYZ038 V26 or above before upgrading to BYZ116 V24 or above. 25 17-AUG-2013 Changed the related-categories display so that it only gets displayed/queried on keyword searches (not on standard category pages etc) when using the DIRECT related-categories option. Changed the top display block so that the Search Results heading only gets displayed on a relevant search/page (eg not on standard category pages etc). Created additional filter reference tables (frd_filterdecranges and fri_filterintranges) to work along similar lines to price range filters, but for other decimal/integer columns. Added new logic, tables, and examples, so that you can search/filter by sets of Ranges (eg volume range, capacity range, length range etc). Added example calls to the additional-search and filter config files for integer and decimal filter ranges. Added extra static and dynamic filter setup wrapper functions for integer and decimal filters (BYZ_SLS_ADD_FILTER_STATIC_INTTYPE and BYZ_SLS_ADD_FILTER_DYNAMIC_INTTYPE, and BYZ_SLS_ADD_FILTER_STATIC_DECIMALTYPE and BYZ_SLS_ADD_FILTER_DYNAMIC_DECIMALTYPE based on BYZ_SLS_ADD_FILTER_STATIC_TEXTTYPE and BYZ_SLS_ADD_FILTER_DYNAMIC_TEXTTYPE). Added extra static and dynamic filter setup wrapper functions for integer and decimal filter ranges (BYZ_SLS_ADD_FILTER_STATIC_RANGE_INTTYPE and BYZ_SLS_ADD_FILTER_DYNAMIC_RANGE_INTTYPE, and BYZ_SLS_ADD_FILTER_STATIC_RANGE_DECIMALTYPE and BYZ_SLS_ADD_FILTER_DYNAMIC_RANGE_DECIMALTYPE based on BYZ_SLS_ADD_FILTER_STATIC_PRICERANGE and BYZ_SLS_ADD_FILTER_DYNAMIC_PRICERANGE). NOTE: If upgrading from a previous version of BYZ116, then make sure you upgrade BYZ038 first so that its the latest version, and then login to your vpasp admin area, and then upload the new version of the byz116_prepare.asp file to your vpasp admin folder on your site, and then browse/open byz116_prepare.asp on your site and check/change the options on the screen to indicate the relevant options for creating the new tables and/or dropping/recreating the price range table etc. Once youve got the new tables in place, delete the byz116_prepare.asp file from your site and then add the Filter screens (decimal, and integers) to your admin menu and grant-out access to them and their tables as per the latest supplied BYZ116 installation notes. 26 05-JUL-2014 Upgraded BYZ038 (from V26 to V29). Upgraded BYZ036 (from V16 to V17). Upgraded BYZ033 (from V18 to V19). NOTE: If upgrading from a previous version of BYZ116, then make sure you upgrade BYZ038, then BYZ036, then BYZ033 before you upgrade BYZ116. Added extra encoding logic to deal with special characters in a better way for the search display text. Added extra filter wrapper functions for money-range filters (eg for price-sliders). Added extra configuration options to specify how to display the remove filter links in the left-panel filter box and cleaned-up/enhanced the filter panel generally. Changed the way that the product paging lines are calculated, prepared, and displayed so that more information is available for the paging, sorting, and products per page display line and so that each of those chunks can be displayed in any order, and also so that the corresponding arguments are cross-checked/fixed before the display functions are called. Added an extra optional argument to the filter configuration wrapper functions so that you can restrict your filters with additional options. Created a new filter/search data type for moneyrange so that you can use a specific monetary range rather than just the price-range auto-range values (for example if you want to use a price-slider in your filters). Clarified and expanded the notes/comments in the filter and search configuration files. Added extra logic to be able to find and display the count of the number of products for a given filter value (ie to add product counts to the filters on the side panel). 1) The The sql query to get the full list of available codes (unique ids) and descriptions from a reference table argument is now expecting a count column as well as code and description columns, so if youre using the BYZ_SLS_ADD_FILTER function directly in your filter config files (byz_sls_$config_filters.asp and byz_sls_$config_filters_dynamic.asp) instead of using the filter wrapper functions (BYZ_SLS_ADD_FILTER_STATIC* and BYZ_SLS_ADD_FILTER_DYNAMIC*) then you need to amend the text that youre using for that argument in your byz_sls_$config_filters.asp and byz_sls_$config_filters_dynamic.asp files. 2) Two new optional arguments have been added to the end of the function to supply the sql clauses needed to get the min/max values for moneyrange (price-slider) filter types. If youre using the BYZ_SLS_ADD_FILTER function directly in your filter config files (byz_sls_$config_filters.asp and byz_sls_$config_filters_dynamic.asp) instead of using the filter wrapper functions (BYZ_SLS_ADD_FILTER_STATIC* and BYZ_SLS_ADD_FILTER_DYNAMIC*) then you need to amend the calls to BYZ_SLS_ADD_FILTER in your byz_sls_$config_filters.asp and byz_sls_$config_filters_dynamic.asp files to add blank values () for the 2 new arguments at the end of the function call. NOTE: The BYZ_SLS_ADD_FILTER_STATIC* and BYZ_SLS_ADD_FILTER_DYNAMIC* functions now have an additional optional argument at the end for a where clause. For a full list of effected files, see the version history file that come with the new zip file. 27 01-APR-2015 Upgraded BYZ038 (from V29 to V31). Upgraded BYZ033 (from V19 to V20). Upgraded BYZ025 (from V08 to V09). Upgraded BYZ162 (from V09 to V10). Upgraded BYZ121 (from V10 to V11). Added an extra option to category filters to allow you to split filters up into separate filter codes for each parent category so that you can list the sub-categories underneath each of the corresponding parents on the filter side panel. Changed how the page-numbers are processed to make them more accurate. General tidy-up of some of the html/text that gets displayed/used. 28 27-AUG-2015 Upgraded BYZ038 (from V31 to V34). Added extra options/logic to allow multiple-selection of values for a given filter using check-boxes (eg to find products which are either red or blue). Corrected additional filter-type processing as they were not working correctly before. Restructured the filter side-panel files/functions/html to help centralise the core logic and separate out any VPCart version-specific differences where possible. NOTE: If upgrading from a previous version, then you will need to add an extra argument (the default value is S) to the front of your existing filter wrapper function calls in your byz_sls_$config_filters.asp and byz_sls_$config_filters_dynamic.asp files, ie the BYZ_SLS_ADD_FILTER_STATIC* and BYZ_SLS_ADD_FILTER_DYNAMIC* functions.